I’ve been taking lessons in ceramics. I’ve loved beautiful pottery all my life, preferring to drink my coffee out of a particular handmade blue mug, geeking out over glazes. I’ll tell anyone who will listen that North Carolina, where I grew up, is a big destination for ceramics, and I personally own a piece by (squeak!!) Ben Owen III that I bought myself with an early singing paycheck. Nerd alert. So, when I learned that Joris, a talented photographer in the Hague, was also a practitioner and teacher of ceramics, I knew I’d eventually have to try it; and when my Damask colleagues beat me to the punch, went first, and began to make the loveliest things and to enthuse about the meditative zen state they achieved in lessons, I signed up. My first lesson was just as zen and glorious as promised. I spent my three hours kneading, and then very slowly and deliberately learning to “throw” (shape an object on the spinning plate), a process with many steps that need to be executed in order with a great deal of finesse. Before you begin to shape the mass, you have to spend quite a while “centering”—which is just what it sounds like, but it’s astonishingly difficult to reach the point where the whole mass of clay is perfectly symmetrical on the wheel, allowing your hands to rest still on the mass as it spins evenly. When you get there, the feeling is magical: a one-ness with the universe. 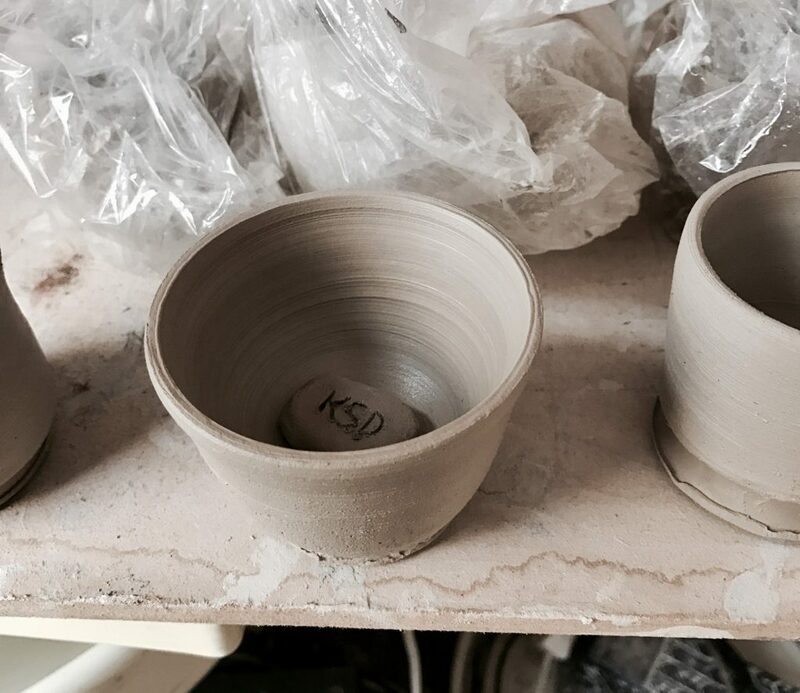 At the end of that first session, I was covered in white clay dust, admiring my two cups resting on a shelf to dry, as blissed out as could be. It didn’t hurt that the pottery studio shares space with a wine shop, and at some point in the afternoon something delicious was opened and shared. No one minds if your glass gets lots of clay smudges on it. My second lesson was nearly a month later, due to various gigs and travel. I was excited to go back, but somehow I didn’t find myself achieving the same head space this time. My first thrown object, a little bowl, worked gorgeously and felt great, but then, trying to shape a small cup, I moved too fast, didn’t center it properly, tried to ignore the ever-increasing thumping wobbliness as it rotated, and ended up with a funny malformed little thing. I hustled it off the wheel and tried to pretend like I’d meant it to look that way, and then spent the rest of the lesson “trimming” my pieces from the previous session—carefully removing partially dried clay from the bottoms of your cups to make feet for them to stand on. At one point I dug too deep and too quickly, gouging out a chunk of foot on the cup I’d previously been happiest with. Now it, too, was a funny cup with a balance problem. At the end of the session, Joris had a mound of clay left on his own wheel, and he invited me to make something with it while he cleaned up and went out for a smoke. I sat down, excited, and began to work; but again, I was too fast, not careful enough, and the whole mass soon spun off its base altogether, leaving me with a soggy lump of clay in my hands and a scowl on my face. I left the lesson still happy I’d gone, but feeling that this pottery thing is only as zen as you are. It’s another art form just like singing that takes a lot of practice, can easily go out of whack, and requires a certain perfectionism. Why, exactly, did I think that inviting this into my life was going to reduce stress? Today was my third lesson. I tried to approach it as calmly as I could. I started out trimming my previous pieces, which I was pleased to see weren’t nearly as malformed as I remembered. The trimming took me ages, because I went very slowly and carefully this time, never dug too far, and in the end I did work I’m happy with. My tiny Impatient Cup (as I now will call it, for the lesson it taught me) even looks good—pleasingly asymmetrical, carefully buffed. When this work was done, I went over to the wheel to get my hands dirty. Since we had less time than usual today, Joris had already kneaded the clay for me, and he’d already centered it on the wheel—the hardest part. With the hard work done, I could enjoy myself enormously as I slowly, slowly shaped, pulled, and thinned the walls of one single cup. I’m learning how little pressure is needed to manipulate the shape or thickness—it’s really a matter of finger positioning. Once in a while, I would give a little too much pressure, or one of my fingers would go dry (which can quickly cause problems), and the tiniest bit of asymmetry would set in; then I’d begin to feel an ominous bump-bump-bump as the cup spun slightly out of alignment. I’m realizing that it’s always smarter to try to solve the little bumps before they become big bumps. This means re-centering: stopping the flow of your work to wet your hands, hold the clay gently but with strength, and nudge it back into the exact, symmetrical center. When it’s right and perfectly centered, it can spin in your hands forever while your hands stay completely still. Cue the time-stopping zen feeling. Joris’s wife is a dancer. He spent much of his professional life photographing dancers. Dance is completely natural to him. It’s natural to think about dance in the teaching of singing, too. Voice teachers invoke it while seeking naturalness or grace of physical effort; there’s a whole artistic discipline (Dalcroze) that uses dance and movement to teach musical structures. Outside of the arts, it’s also a metaphor for freedom and abandon—dance like no one’s watching; forget your troubles and dance; feel the beat of the rhythm of the night, dance until the morning light. And yet. For my whole musical life, I’ve had a funny relationship with dance and movement. I was an almost pathologically shy kid and teenager. My first decent-level choir was called—for real—2nd-2-None, an auditioned show choir specializing in choreographed pop songs. I step-touched clumsily with everyone else while envying the few people in the group who seemed to pick up and remember the steps without effort. Later, in college, I was in an excellent concert choir whose members seemed to veritably dance as we stood in one place singing Schütz motets and the Mozart C Minor Mass; swaying, head bobbing, and half-conducting with the score were all encouraged. I loved it, but for years after I was scolded for excess movement while I sang. I couldn’t help but externalize the musical beats in my body, even when doing so interfered with proper voice function. My first efforts in opera were physically and dramatically awkward; I would seize up and hardly know where to look, or what to do with my hands. Outside of singing, I was finally learning, in my early 20s, to loosen up and be less shy, and I loved to dance with groups of friends, but I was doing it in my own erratic, untrained way, always shrinking out of sight if it seemed anyone was paying too much attention to me. In short: movement and I weren’t the best of friends. These days, with the help of a lot more stage experience, careful vocal teaching, better physical fitness, and less self-consciousness in general, movement and I get along fine. I learn a little more every year about the ways movement and singing can both help each other and interfere with each other, and every year I commit to a stronger and more flexible body as my job gets physically more challenging. It’s getting better all the time, but I still have to work hard not to “dance” the music while I sing it, my old college habit. This involves a lot of work at the mirror, a lot of practice, and very deliberate attention. When I can manage to re-direct all that unplanned, wasted physical effort into more productive channels (strengthening my support, deliberately freeing the neck, maximizing clarity of vocal attack, or physical acting), I almost always notice an improvement in the sung sound, or in my stamina, or both–I’m *more* expressive without that dancing, not less. Today, when Joris told me that the goal was for the clay to “un-dance,” something locked into place in my mind. In pottery, the clay is the medium for my artistic desires, which are realized through my hands. In music, my voice and body are the clay. They’re the medium for an artistic voice. Music can sound symmetrical and classical, or it can sound spiky and terrifying, but it always has to be executed from a place of physical safety and stability, at least if you want to maintain a healthy performing career. The clay and the singer need to “un-dance.” The clay is in constant motion, but the motion is shaped by the external forces of the wheel and my hands; when the clay begins to un-center, to wobble a little, it endangers the whole operation, and you have to stop and get it back into alignment, or else you’ll have problems like I had in my second pottery lesson: asymmetry, holes in the sides of the cup, complete separation from the spinning base. Similarly, the singer needs to “un-dance.” It’s not that a singer should never move—far from it; a singer is constantly moving, and sometimes also dancing or acting or both. But the movement needs to retain internal structural integrity. Inside the contained physical world of the singing voice (the head, neck and torso), things need to be spinning freely and symmetrically under the hands of the music. The music can then take any shape it needs to, but if stuff is out of line inside and begins to bump, the whole thing comes unmoored. With physical mastery and artistic imagination, singing can also give the singer and the audience a feeling a time-stopping zen. A line might go on forever; all of us are completely in its power. It’s a wonderful, wonderful feeling. It is about moving – constantly – but on the inside.